The Christie has backed ground-breaking efforts to recruit an army of ‘Cancer Champions’ in Greater Manchester. The world-leading cancer centre has officially signed up to endorse the Vanguard Innovation scheme in which individuals use their passion and commitment to support people at risk of developing the disease. 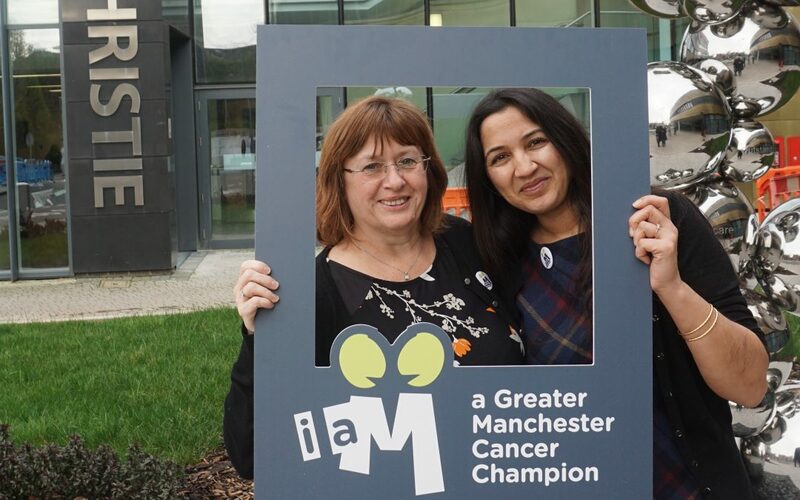 Greater Manchester Cancer Champions share messages that help people to quit smoking, encourage friends, neighbours and colleagues to take up cancer screening invitations or go to their GP if they have symptoms they are worried about. They also receive feedback from people to help improve patients’ experience of their treatment. More than 2,000 individuals have signed up to become Cancer Champions since the project was launched 12 months ago, while around 50 organisations have also given their backing. The Christie has joined a social movement of organisations across Greater Manchester who have made a commitment to improve early detection of cancer, while also supporting staff and their families to take charge of their own health and wellbeing to reduce their risk of developing cancer. Staff will have access to regular newsletters, training opportunities and support to help them share key messages with colleagues, family and patients. You can also sign up as an individual and receive the same support and training. The Cancer Champion recruitment drive aims to reduce the number of people getting preventable cancer: research suggests that more than 40 per cent of cancers are preventable through lifestyle changes. And while survival rates in Greater Manchester are improving, there is still a lot of work to do. In 2014, 14,500 people were diagnosed with cancer, compared with 13,600 in 2011. In 2013, 6,700 died from the disease. One such Cancer Champion is Gilbert Morgan, who was given the all-clear from prostate cancer in 2014. He said he became a Cancer Champion to urge friends, family and colleagues to visit their GP if they were concerned about possible symptoms. ‘I’ve always said that if I can save just one life by talking to people then I’ve done my job. ‘I became a Cancer Champion a couple of years ago and I wanted to do it because I didn’t want people to experience what I did – I found it difficult to get information and didn’t know where to go for support. The Christie’s Chief Nurse and Executive Director of Quality, Jackie Bird, was on hand to formally sign up to the scheme. She said: ‘As one of Europe’s leading cancer centres we see the impact cancer has on our patients every day. We’re delighted to give our backing to a campaign that aims to improve cancer outcomes. The scheme is spearheaded by Greater Manchester Cancer Vanguard Innovation, a programme launched to test new ways of delivering cancer services in Greater Manchester. It is based at The Christie but includes specialists from across the region, and it leads a partnership in which the voluntary sector plays a crucial role. Ben Gilchrist, who leads the Cancer Champion project, said: ‘The Christie’s decision to support the Greater Manchester Champions movement is fantastic news. They will join the 54 organisations who are already helping us reach thousands of champions – both people who are already working hard to raise awareness about cancer in their communities, and new people who can help too. Individuals or organisations who want to become cancer champions can sign up here. Cancer Champions also have their own Facebook page.